Bronze is a beautiful and extraordinary material both to work with and to possess. Having initially trained and worked as a ceramic artist I was used to being in full control of all processes from beginning to end and remaining totally immersed in the creative process, able at any stage to respond and make changes or improvements. My early enthusiasm for translating ideas into bronze was soon tempered by frustration. I found the process of sending off a sculpture in one medium and then receiving back the finished bronze unsatisfying. Sometimes the results were good, but often the transition was disappointing. Significantly, due to the high costs involved in foundry casting, decisions about what was “good enough” to go to the foundry was constraining and also led me to overwork some pieces. In response to my desire for a more vibrant, immediate and experimental approach to bronze I set up my own casting facility Black Mountain Bronze. Now I have the freedom explore, play and most importantly be responsive to create pieces that still have the degree of rawness and energy that I crave, allowing for creative input at every stage and the opportunity for serendipitous events. My foundry is also now brings me into regular working contact with other artists and makers who are equally excited by the idea of working in bronze. Running workshops and courses and mentoring a growing cohort of emerging bronze workers supports and energises my practice, providing creatively both a crucible and fire. Bronze is both contemporary historically significant, having strong echoes deep within our recent evolutionary past. The casting of bronze is a raw and elemental process that can be achieved around a campfire with beeswax and clay or in sophisticated foundries using high tech furnaces and technical materials. At the heart of the process is the transformative slight of hand, like fossilisation where one object becomes another under the influence of extreme heat. 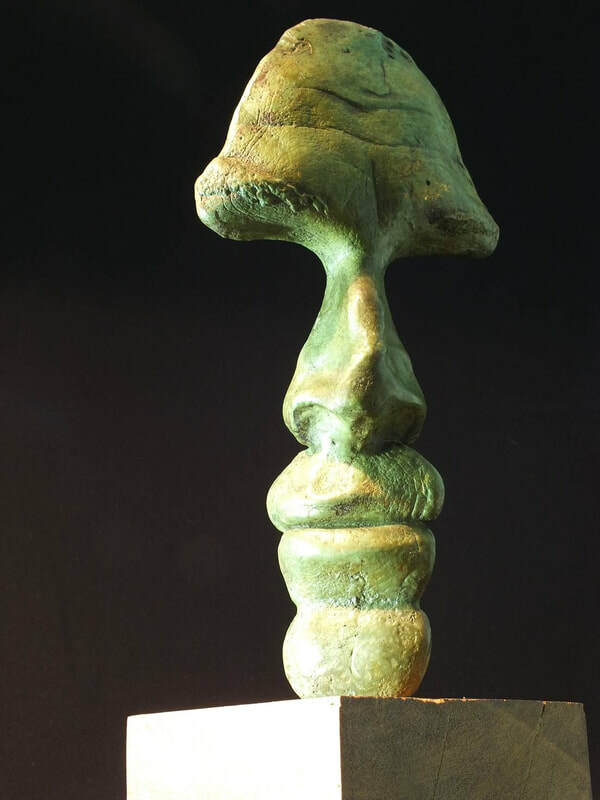 Organic materials or wax are replaced by bronze in the casting process, via a combination of intention, earth and fire. Finishing and colouring bronze is equally transformative, from the crude exposure to the weather or seawater, to the sophisticated use of chemical sequences, heat and fume chambers. Bronze working is time consuming and expensive, but the effort is well rewarded. Its energy, heft and subtleties combine with form to create an almost ineffable quality and presence to every work and as if that wasn’t enough, bronzes improve with age and handling and develop exciting new patinas and personalities over time.